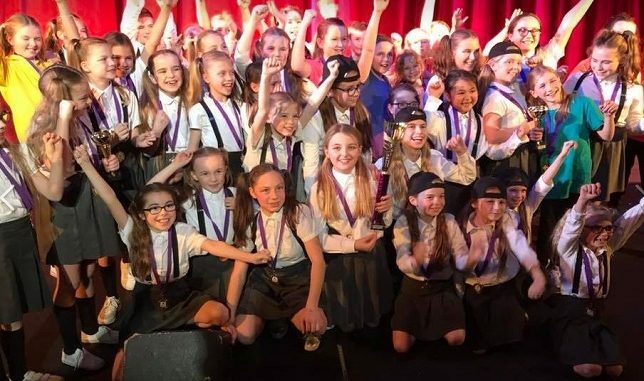 Talented pupils from St Peter’s Junior School have taken part in a performance competition held at the Tower Theatre in Folkestone – and scooped a handful of trophies. Twelve of the youngsters took part in the ‘chorale’ singing ‘Back Pocket’ with carefully thought out harmonies. For most of the children it was the first time they had performed on stage in a theatre and there were lots of backstage nerves. However, their hard work paid off, as they came first in their category – ‘Under 11’s Vocal Group’- and were thrilled to be presented with a trophy and medals. Next came the Elite Dancers who performed ‘Naughty’ with mischievous enthusiasm, and a credit to the drama department at St Peter’s. This was the first time Elite Dance had combined singing, dancing and drama into one performance. During the presentations, it was highlighted to the children that being able to do all of this is key to taking their careers further later in life. Throughout their time at the competition both groups were praised for their high standard of innovative, original choreography. They were led by Mrs Seeney, St Peter’s Year 5 teacher and dance leader, who said: “I’d love to say that was all me, but I’m even more proud to say that Evie from Year 5 choreographed and taught a section herself – quite an achievement for one so young!” Including strong, animated and confident solos from Molly, Daisy-May and Teaghan, they were all congratulated for their performance and came first in their category – ‘Junior Group Song and Dance’. St Peter’s went on to win the title of first place overall in the competition, being presented with trophies, medals and a £500 prize for the school.